This PDF 1.5 document has been generated by Microsoft® Office Word 2007, and has been sent on pdf-archive.com on 06/07/2017 at 21:02, from IP address 208.102.x.x. The current document download page has been viewed 142 times. File size: 241 KB (10 pages). be operated exclusively on a cooperative and nonprofit basis. cooperatives; and (vii) concern for community. patronize the Co-op and will accept the responsibilities of ownership. any change to the owner’s name or address. financial obligations or reestablishing a patronage relationship with the Co-op. accommodated by means other than direct access to such records. the parties and assist them in developing a mutually acceptable settlement. pursuant to Articles VII and VIII of these bylaws. the notice of the meeting shall be of an advisory nature only. notice and to vote with respect to the subject of such notice. for the transaction of business at any meeting of owners. shares owned or subscribed for. Voting by proxy shall not be permitted. considered a meeting of owners. presented to a vote of owners. mission of the Co-op are properly carried out. 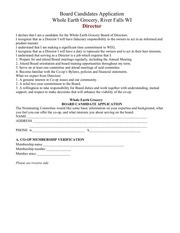 be eligible to serve as a director. authorized business of the Co-op. owners not latter than the next-scheduled meeting of owners. 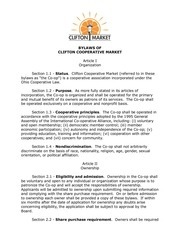 responsibilities in the oversight of the Co-op. 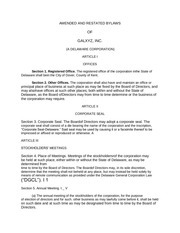 expiration by owners or by the Board under procedures set forth in Ohio law. by the Board for good cause, be presumed to have resigned. 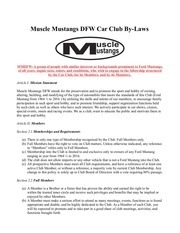 failure to do so shall not affect the validity of the meeting. deemed to have waived any objection to the notice. 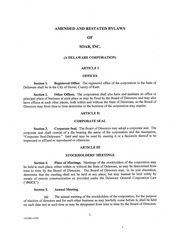 percentage is required by law or by these bylaws. filed with the minutes of meetings. be closed as to matters of a confidential or sensitive nature. by the Board at its first meeting following the annual meeting of owners. Officers shall serve for terms of one year or until election of their successors. best interests of the Co-op would thereby be served. operations at the annual meeting of owners. price shall not be less than the par value per share of one hundred dollars. subject to full repayment of redemption proceeds. netted into a single allocation unit. the taxable year in which such notice is received. owners and shall accrue no dividend or other monetary return on capital. Co-op and by assessments resulting from tax audit adjustments. subsequent years as required or permitted under federal income tax law. a director, officer, or owner. This file has been shared by a user of PDF Archive. Document ID: 00621460.